A sunny, frigid January is the best January, just ask a Canadian. In celebration of the UK&apos;s cold snap, the HAT&apos;s 2019 kicked off in much the same way as its 2018 - with a fleeing of the country. Team members were in Cyprus this month lining up our year, which has proven to be an excellent way to get geared up. We are very proud this month to welcome four new Partners to the HATLAB Sandbox this month, all of them building solutions in the future of personalisation in retail, insurance, human resources, and online community management. One of these is our feature this month, as the first-ever technical "vendors" of HAT data accounts in a customer environment. OneZeroMe is building algorithmic scoring tools for insurance customers (and other services). Their plug-in, a basic online widget, can spin up a HAT that includes a Facebook DataPlug in just a few clicks, and with it score a users&apos; viability for improved services from a market of insurers. The users&apos; data stays in the users control (stored remotely on a HAT) while OneZeroMe and their customers get the signal they need to deliver a service. This is the future we&apos;ve been talking about for lo these long years. Raw data isn&apos;t an asset if all your apps or services really want is a signal. Users do not need to be exposed just in order to be served. Our goal is not to become less connected, less known, less valuable, or less rich in the future - we want more of all of those things, and regulations, ethical quandaries, arcane permissioning, and complex engineering all get in the way. What if, like OneZeroMe, we only used what we needed? Welcome to 2019 everyone. Let&apos;s get HATTED. 30 January | OneZeroMe, a new digital widget for transforming your online data into personalised scores, won a little internal race this month to become the first app of 2019 to issue HATs to their customers in a frictionless environment. The app will be the HATs first live environment "vendor" - sharing HAT personal data accounts with their users in order to get the signal they need, while leaving the raw data that creates that signal in the control of the new signup. OneZeroMe is live in the HATLAB Sandbox Environment and is expected to enter live circulation in February 2019. The HATLAB GIN Scheme has announced OneZeroMe as its first portfolio application, funding up to 1,000,000 HATs in early circulation from the insurance widget. GIN Scheme funding is accessible to A-rated HAT Applications internationally, and applications are available online. HAT is proud to welcome Mark and Maven as an official partner, starting January 2019. Mark and Maven are building the future of the resume for use in hiring apps around the world. HAT is proud to welcome Pickatale as an official partner, starting January 2019. Pickatale are building data-rich eReading materials for children and parents in Europe. HAT is proud to welcome WeTipp as an official partner, starting January 2019. WeTipp are a SaaS Platform for community management, working with enterprise clients in Italy. WeTipp&apos;s customers get apps that help them connect their community members with messaging, scheduling, marketplaces and more. Cyprus is lovely this time of year - especially if you&apos;re worried about crashing out of Europe and need a new home on the other side of the channel. Thanks to the engineers, operations, and marketing team that joined in, and to Irene for hosting. The HAT commercial order has renewed in celebration of the new year, and we are proud to be championing a very credit-card-like "creator-issuer-vendor" model to make it easier for everyone to get HATs into their lives. New technical achievements were made this month, and you can now issue HATs to your users that have data already inside them with just a few clicks. In fact OneZeroMe are doing it RIGHT NOW. 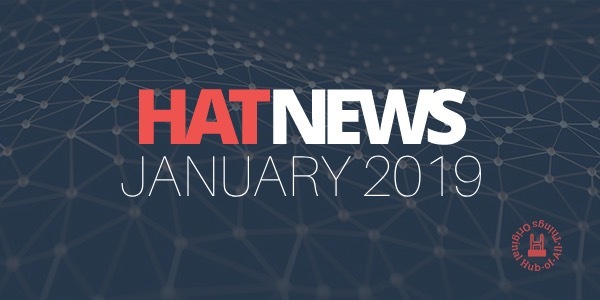 The HATDeX Advisory Board met on a freezing end of January to discuss 2019&apos;s roadmap. Thank you everyone for your support and advice (you know who you are).